Home Uncategories Brad Ausmus ruined Sanchez's best start, what else is new? Brad Ausmus ruined Sanchez's best start, what else is new? Brad Ausmus is a certified idiot when it comes to baseball strategy. I just re-watched the final few innings of Game Two, ALDS 2014, to remind myself of that. I still kind of feel the need to throw up afterwards. I don't expect the Tigers organization to extend Ausmus's contract past this season, and I'll be more than happy to see him go, even if I'm also keenly aware that whoever replaces him is probably going to be just as asinine when it comes to solid strategical decisions. Let's be honest here. People have been clamoring to get Jim Leyland back for over a year now, and a lot of those people are the same people who couldn't wait to see Leyland gone. The grass is always greener, familiarity breeds contempt, other cliches and so on and so forth. But back to Brad Ausmus and his limitless ineptitude. One thing we've known about Sanchez all year is that he really starts to fall apart after the sixth inning. His collective ERA through the first five innings is 5.76 (yes, that's bad), but in the sixth inning it jumps to a 12.96 ERA. He sixth innings this year have been more than twice as bad as his previous innings combined. But in last night's game, after giving up a leadoff single, he struck out the side in the sixth. It was nothing short of a minor miracle, and at that point, having thrown 95 pitches, that seemed like a good time to pull him and turn the game over to the bullpen for the seventh inning and beyond. That's hindsight, to some extent. The Tigers were down 1-0 to the Minnesota Freaking Twins, so probably that was a great time to treat this situation like a lead, which would mean proceeding with the usual trio of Justin Wilson, Shane Greene, and K-Rod. If that had happened, and if those three had pitched like they usually do, the Tigers would have won the game 2-1. Instead, Brad Ausmus sent Sanchez back out for the seventh inning. Lord Krishna only knows why, but he did, and then some bad things happened. Shoulda Been: one out, nobody on. Actually Was: nobody out, runner on first. The next batter singled, so, Shoulda Been: runner on first, one out. Actually Was: runners at first and second, NOBODY out. That was when Ausmus decided to pull Sanchez. Again, Lord Krishna only knows why. Pull him before the inning starts, let him deal with his own mess, or hell, TREAT THE GAME LIKE YOU'RE WINNING AND GO TO JUSTING WILSON, but the last things you wanted to do here was bring Bruce Rondon into the game with runners on. Rondon had already blown a tie game against the Indians on July 4, and then he blew a 2-1 lead against the Blue Jays just a few days later. This was probably not the guy to manage a nobody-out, two-runners-on-base situation. The next batter dropped down a sacrifice bunt, which led to, Shoulda Been: two outs, runner at second, but Actually Was: one out, runners at second and third. 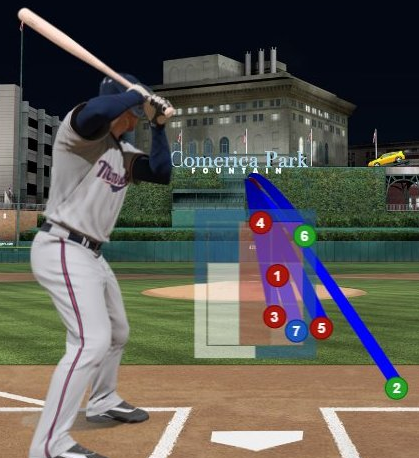 That sixth pitch should have been a called third strike three, end of inning, score still 1-0 in favor of the Twins. Instead, it was called a ball, and the next pitch was ripped into center field to make the score 3-0. 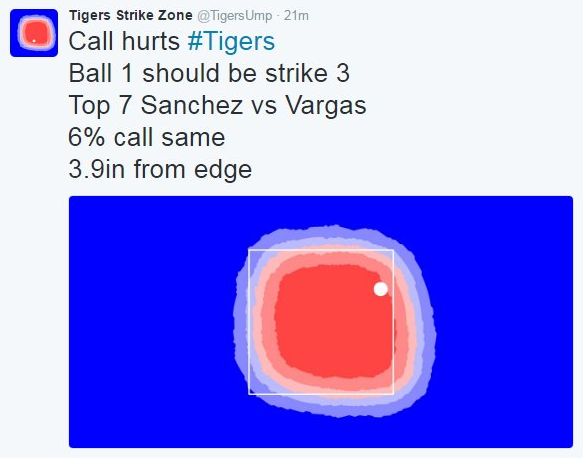 Those two runs were charged to Anibal Sanchez. 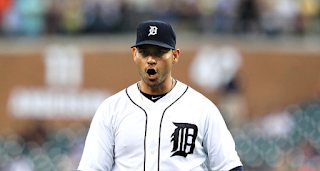 Not to the umpire who blew the game so hard he should have needed reinforced knee pads, not to Bruce Rondon who shouldn't have been in the game, and not to Brad Ausmus who should not be managing a baseball team. As for the rest? Next came a swinging strikeout, which would be the fourth out of the inning if Lord Krishna actually existed, or at least the third out, in some other universe of better umpiring. But instead, it was only the second out, which left room for Rondon to give up another single, and then a home run, and let's just forget the rest. The Tigers rallied in the ninth, but with a 6-2 score and runners at first and second with only one out, Brad Ausmus let Mike Aviles and James McCann bat without even attempting to pinch-hit Jarrod Saltalamacchia, Tyler Collins, or anyone else not named Mike Aviles or James McCann. Ausmus reasoned that Twins closer Brandon Kintzler had better numbers against lefties, which is exactly the sort of almost-there mathematical reasoning you'd expect out of Ausmus. So close, yet still so clueless. Yes, Kintzler has better numbers against lefties, which means that -- in a completely context-free zone -- right-handed batters are the better option. Unless those right-handed batters (Aviles and McCann) are hitting a combined .187 against right-handed pitching this season. In which case, get somebody else in the box. A better right-handed batter, a left-handed batter who has a history of success against right-handed pitching, anything but Aviles and McCann. So the Tigers lost. They lost because Miguel Cabrera and Victor Martinez are hitting a combined .183 in the month of July. They lost because they let Tommy Milone shut them down on 10-12 pitch innings (when 15 is on the low end of "average"). They lost because Brad Ausmus is bad at strategy, and Mike Aviles and James McCann are terrible against right-handed pitching. They did not lose because of Anibal Sanchez. That was probably the best game he'll pitch all year. I don't expect that he's "back," or any such similar pipe-dreaming. Maybe someday Brad Ausmus will learn how to manage his starting rotation. Maybe he'll also learn how to manage a bullpen with an intent to win, not just a hope to survive. Maybe he'll learn how to correctly deploy pinch-hitters in the best situations. But probably not before Anibal Sanchez pitches like that again.